There is a lot of research happening in New York City's parks! I’m putting together a permit application on behalf of WSP Eco Projects and have been reviewing Research Permit Reports [pdf] and NYC Urban Field Station Progress Reports [pdf]. 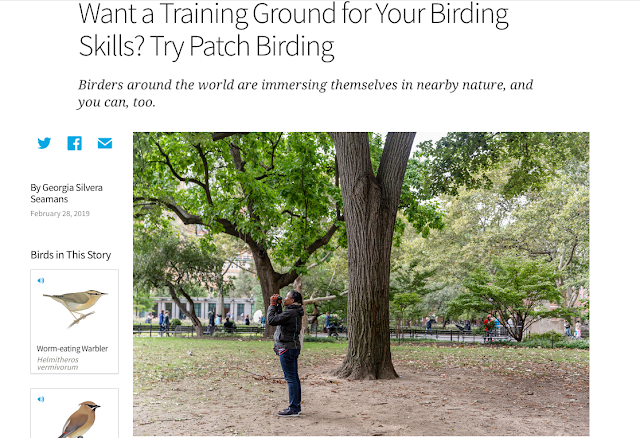 The proposed research project for Washington Square Park is an extension of the one day wildlife data collection pilot we coordinated with SciStarter for the 2015 World Science Festival. Fingers crossed for our application! Now, let me tell you about those other research projects. In a nutshell, the NYC Department of Parks & Recreation Forestry, Horticulture, and Natural Resources Division granted 93 research permits in 2015. Of these, 33 were renewals of existing projects. Applicant affiliations spanned the private, public, and nonprofit sectors, with the majority of applications from universities. Also, projects are occurring in all five boroughs as well as citywide and across parkland types. The borough with the most research permits issued is Manhattan and the park with the most permits issued is Central Park. City-wide/multiple borough research projects account for 32% of research permits issued. In terms of research topic, over 35 permits have been issued for plant research followed by over 25 permits for soil and close to 25 permits for arthropods. Research projects about amphibians/reptiles and worms each have below 5 permits. The oldest ongoing research project is the Breeding Bird Survey of New York City by Susan Elbin of NYC Audubon. The permit was first granted in 1982. The next oldest project is Melissa Cohen’s Electrofishing Fisheries Surveys. This NYS Department of Environmental Conservation project was started in 1996. See page 5 of the Research Permits Report 2015 Annual Report for permits issued between 2011 and 2014. I am excited about the Avian Acoustic Ecology Project by NYU graduate student Joseph Doumet and professor Tae Hong Park. The project is based in Washington Square Park! Check out Tae Hong Park's Citygram, an "interactive environmental-sensing project." Two recently permitted projects use “barcode” in the title: Urban Barcode: Worms in Cunningham and Francis Lewis Parks by Christopher Ades at St. Francis Preparatory School and Urban Barcode Project: Sunset Park by Megan Wallner at Sunset Park High School. Do you know about the Billion Oyster Project, to restore one billion live oysters to New York Harbor plus engage K-12 students in STEM? Kimberly Schwab of the Speyer Legacy School received a permit for Billion Oyster Project/ water quality monitoring. I’ll also mention Ronald Sarno’s, based at Hofstra University, Selective behavior by rodents in the built environment: A pilot. There are 55 other new and fascinating projects. For all the permits issued in 2015 see pages 6 and 7 of the Research Permits Report 2015 Annual Report. 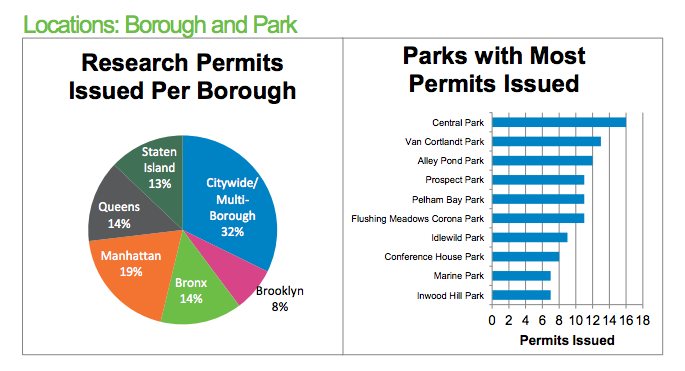 So that was just one set of research in NYC parks. The other portfolio of research comes out of the NYC Urban Field Station, a collaboration between the USDA Forest Service Northern Research Station, the NYC Department of Parks & Recreation, and as of 2013, the Natural Areas Conservancy. Eight research buckets were summarized in field station progress report published in 2014. 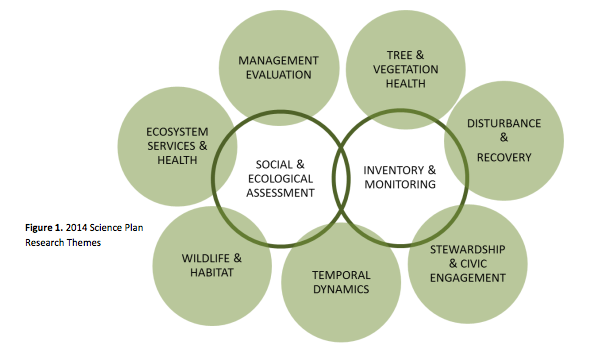 They are Tree and Vegetation Health, Disturbance and Recovery, Stewardship and Civic Engagement, Ecosystem Services and Health, Wildlife and Habitat, Inventory and Monitoring, Management Evaluation, and Ecological and Social Assessments. Within each category are one to eight projects. One that I am particularly interested in following is Trees Flooded by Hurricane Sandy by Rich Hallett, Nancy Sonti, Ross Whitehead (Rutgers intern), and Michelle Johnson. 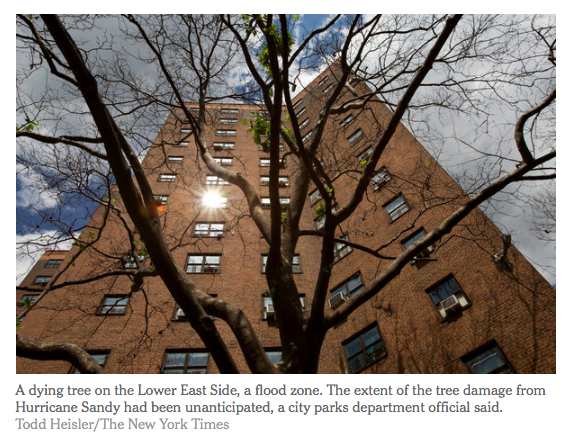 After the hurricane I began thinking about how severe disturbances, especially to urban areas, affect people's sense of place and collecting stories about tree elegies. My dissertation was about the transition of the role of the street tree from one of beautification to environmental service provision in the policy and planning arenas and the actors, institutions, and mechanisms that mainstreamed the ecological view of the street tree in California cities. Because of this experience, I am very curious about Lindsay Campbell's project City of Forests, City of Farms in which she examined policy and planning documents and their implementation between 2007 and 2011 to theorize "how urban nature [was] constructed in New York City". There are two bird projects. One, Lifetrack Egret, co-led by Erika Svendsen, Susan Stanley, Susan Elbin (NYC Audubon), and John Brzorad (Lenior-Rhyne University), tracks egrets using GPS and cell phone technology and each egret's data is sent to a specific classroom to inform curriculum. The other is the Harbor Herons nest surveys by Susan Stanley and Susan Elbin. In addition to research, the Urban Field Station engages communities of interest through various science outreach and communication programs. The field station has dedicated staff but also supports, scholars-in-residence, fellows, interns, and fellows. If you could, what kind of research project would you conduct in a NYC park, or in a park in your community?